Searching for a new dental practice in Vernon, BC, can be a big task. Many patients start with an internet search for “dentist near me” and hope for the best. However, it’s important to take the time to do the research to find the right dentist and practice. Location: While you may only plan to spend two visits a year with your dentist, it’s hard to predict what might change in the future. Finding a practice that’s conveniently located near your home or office is key to ensuring that appointments are maintained. Services: Being able to receive all your necessary dental services under one roof is a comfort to most patients. 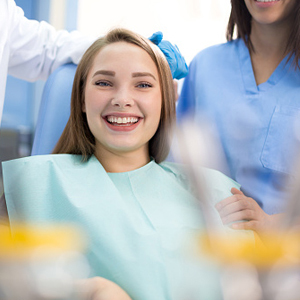 In addition to providing regular cleanings and checkups, look for a practice that also offer restorative and cosmetic treatments such as root canals, implants, teeth whitening, and bonding. Experience and expertise: Look for a dental practice where the team has deep experience and is familiar with new trends and technology. Relationship with the dentist: A consultation appointment provides patients with the opportunity to meet the dentist and ask questions. This also gives patients the opportunity to decide if they feel as though they can be completely comfortable with the dentist. Office environment: When visiting the office, look for a warm and friendly staff, a comforting and calm environment, advanced technology, and happy patients in the waiting room. These factors indicate that the dentist has earned patients’ trust and respect. Drs. Pita Dhaliwal and Kevin O’Shea provide comfortable, effective dental care to Vernon, BC patients. The entire team at Aberdeen Dental understands that today’s technology is best when combined with gentle and skilled care from professionals who respect their patients. To schedule a consultation, call Aberdeen Dental today.